A minimum viable product is vital for idea validation. Some product owners avoid this step and hope to get lucky. Others are smarter, opt for lower risks and build MVP before entering the market, just like Foursquare or Dropbox did. Everyone is free in his or her preferences. However, if you chose the second way, you’re likely to find useful this simple and lightweight guide to build an MVP. Let’s start with a short checklist of what it means and why product owners need it. MVP is an acronym of a minimum viable product. This concept foresees the creation of a barebone version of a functional solution to check the viability of flows core to product idea. It means, the MVP should be close enough to the real product you plan, so that the user feedback is valuable and simple to verify main product ideas or core concepts and flows quickly. It’s not a proof of concept or prototype since MVP has a different purpose – to validate an opportunity hypothesis and learn from user feedback. The minimum viable product is not a way to save costs on launching a startup. That’s not the only MVP misconception you may encounter. 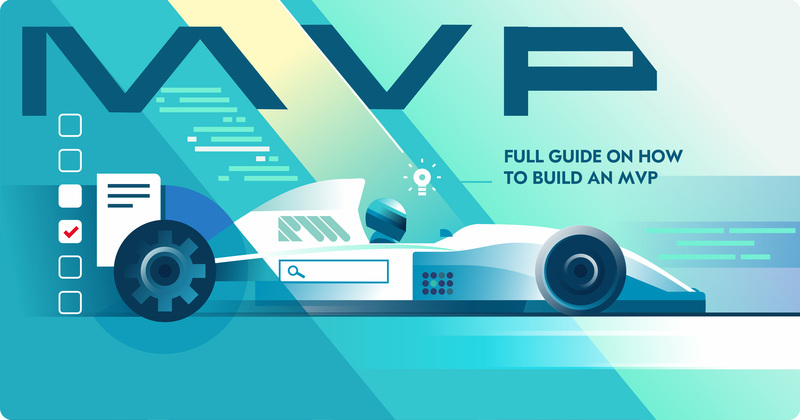 MVP is a way to launch a product fast and understand what to improve next. Can you go without building a minimum viable product? It is a risky but shorter way to production. But do not expect to save time on development. You’re likely to reduce time expenses only on marketing and handling user feedback sessions. Besides, when your goal is to raise funds, MVP is not always your ally. If you’re pitching investors with a barebone product, you’re selling not product expectations but the actual result, the proof that the product can be monetized. The major risk here is to fall short of investors’ expectations. And you likely will if your MVP is faint. Otherwise, there is nothing to worry about. Startup MVP development guarantees several benefits to product owners like market validation, resources optimization, early user acquisition, and focus on the value proposition. Simply put, it answers the question “Will my idea generate value for people and revenue for me?” A feasibility study together with proof of concept and prototyping are not enough to validate the idea. MVP is almost a single reliable way to obtain the opinion of a real external user early. It reduces the risk of investing a ton of money into something nobody wants or allows you to learn if there is a way better product already present. The concept of a minimum viable product is rather extensive and covers different types and approaches. If you’re a startup founder, you don’t have to be a programmer to get your MVP done. Here are some options available in this regard. A no-product or no code MVP is an approach for validating an idea and getting feedback without actual coding just like Eric Ries stated in The Lean Startup. And you have two ways to make this implemented. This approach is a way to test an opportunity hypothesis using marketing campaigns. Idea visualization does not contain any building blocks of your future product. It just represents or explains how it will look and what it will do. The approach can be implemented via landing pages, advertising campaigns, surveys, explainer videos, blogs, etc. The biggest advantage of idea visualization is its time and cost-efficiency relative to other MVP creation methods. For example, the Dropbox MVP was a basic demo video, where Drew Houston, one of the co-founders, narrates how the technology is meant to work. It drove hundreds of thousands of users to the website and increased their beta waiting list by 15 times overnight. The idea of this approach is to start a presale of a product before actually building it. The most practical option is to launch a crowdfunding campaign on a relevant platform like Kickstarter. If you succeed, you not only get proof that your idea is in demand but also raise a sort of seed investment from contributors. The gist is to launch an up-and-coming campaign to sell a product that doesn’t exist yet. The benefit of this approach over idea visualization is that people not only commit by word but also by money. So, it might reflect actual revenue generating possibilities. A good example of the ‘sell first, build afterward’ MVP is LiveCode. They managed to pledge over $640K from over 3K contributors. A mockup allows you to deliver a part of your future product’s functionality. Meanwhile, some complex automated features can be replaced with easier-to-build or manual-driven solutions. You have several options to create MVP using the product-mockup approach. To understand this approach, let’s take a product containing a recommendation system as the main feature. In this case, it’s not necessary to architect complex machine learning algorithms to build MVP app. The goal is to show how this feature will work and therefore the recommendation engine can be handled manually at this stage of development. Airbnb is a typical example of concierge MVP. Initially, the app had no sophisticated technology under the hood. The job to be done was performed by human operators also known as mechanical turks (not to be confused with a crowdsourcing marketplace known as Amazon Mechanical Turk). Later on, the product obtained automated functionalities. Check out the Airbnb lean canvas to see how the startup bootstrapped itself. Like concierge MVP, this approach still involves the use of manual labor to simulate core functionalities. However, the idea of the Wizard of Oz MVP is to hide this fact from a user. You may have just paper cards with drawings and someone who will shuffle in response to your actions, but the user will think it’s driven by AI (or magic:). Thus, the minimum viable product delivers a close-to-genuine user experience with a slight time delay. Zappos is one of the startups that launched as a Wizard of Oz MVP. It represented a website stuffed with a good selection of pictures of products they were going to sell. Orders were not processed automatically until the scale simply became too large to be handled by humans. The name of the approach itself explains the concept. Since your users need to understand what it is meant for, the focus should be made on the core functionality. So, you need to build the MVP with a view to getting the user’s job done by at least 80%. Railsware has used this approach for our products – Mailtrap and Smart Checklist for Jira. With Mailtrap’ MVP, we provided the users with a solution to test products containing email sending functionalities without spamming real users. When developing the minimum viable product for Jira Smart Checklist, the epic or single feature was the ability to convert Markdown into checklist items. Afterward, both products grew with numerous adjacent and supportive features. Design: illustrations, general visual appeal, micro interactions, etc. Streamlined flow: enhanced user mental model through intuitive information architecture, known vocabulary, visual cues, etc. Your MVP can be deemed MLP if the first-time UX delivers an emotional story. These lovable traits will help it stand out among alternative solutions. Spotify is a good example of the MLP. Though their first MVP was a landing page, the second barebones product version was not only functional but also user-attractive. In retrospect, we can deem this product lovable due to the hype it created in the market. Now, let’s take a look at the fundamental steps every product owner has to come through before the MVP launch. Which problem your MVP is meant to solve? You need to understand the value the product is going to deliver and how users will benefit from it. For this purpose, we advise you to take advantage of the value proposition canvas: learn the pains (problems) the customer suffer or might suffer from, as well as gains they obtain or expect to obtain. Which sort of users will be interested in it? It is essential to understand who will buy your product. Certain categories of users have specific needs and requirements that will help you make the product as user-oriented as possible. What are the existing solutions to this problem? Competitors research will allow you to consider the drawbacks of direct competitors (for red ocean with lots of alternatives) and pitfalls of the indirect ones (for blue ocean with lack of direct competitors) and avoid them in your product. The next step deals with features you want to have implemented in the product. You need to create your product vision (think long-term) and discuss different features that may be valuable for customers’ needs in their specific contexts of usage. Once it is done, they need to be prioritized by importance. For this purpose, we leverage MoSCoW framework and divide features and tasks into must-haves, should-haves, could-haves and won’t-haves this time. At the MVP stage, you’re likely to have one top-priority feature, which conveys the product core value. Your choice should be based on the idea to be validated and the available resources. We’ll talk about them in detail in a separate chapter below. It is an essential step, which is useful for further prioritization of features and breaking down the product backlog. Story mapping consists of four components: Goals > Activities > User or Job Stories > Tasks. Goals underlie the pivotal vision of a product. You can achieve the goals by performing specific activities. The activities, in turn, require the implementation of tasks and features that can be converted to user or job stories. With the story map, you get a convenient tool to identify pains and gains associated with your product. Once you’ve learned how to build MVP and got everything prepared to launch, you’re halfway through. The next half of the battle lies ahead where you need to make a thorough analysis of actionable product metrics. Key metrics to measure your MVP success? Customer feedback is an important metric to measure throughout the entire pipeline. However, it is extremely actionable at the MVP stage. You can find out how things are going by interviewing your customers. Listing the problems to be fixed and expectations to be met will help your product evolving in the right direction. If you lack ideas on how to get feedback on your product, check these ways offered by the CPO of ICX Media. NPS or net promoter score is a survey-based metric. It means you need to ask your users directly about how good the MVP is. Traditionally, it is like “will you recommend it to others” or “how would you rate your experience” and so on. The score scale is from 0 to 10, where two categories of users (actually three, but passives are of no value) can be defined: detractors ( rated 0 to 6) and promoters (9-10). NPS is the difference between the percentage of promoters and detractors. Your MVP’s net promoter score can be deemed successful if it is above zero. And the greater score you obtain, the better. Activation is all about how good the user’s first experience is. If the number of signups is growing fast, it is evidence that your product is doing well. New customers will bring not only revenue but also user stories to improve your startup. Meanwhile, if new users do not come, you need to find out one of the possible reasons: poor UX or crude marketing campaign. The notion of active user differs depending on the product. For example, at Mailtrap, it is recognized according to a specific number of emails sent per month. Thus, we’re interested in monthly active users (MAU). At the same time, if you want to build MVP website with the focus on social communication, you’re likely to benefit from daily active users (DAU). In such a way, if your active usage metric goes up – you’re on fire; down – you need to tweak user engagement. Money-based data should also be taken into account from the outset. MRR or monthly recurring revenue is the core financial metrics for each SaaS product. It shows the volume of money your product generates per month. The revenue usually includes a direct income, as well as all possible upgrades/downgrades, reactivations, churns, discounts, and other money-related activities. One-shot fees and payments are not a part of MRR. Another financial metric that you can measure at the MVP stage is customer acquisition cost (CAC). It displays how much money is needed to get a single customer. CAC is important to analyze how scalable and profitable the product is. For example, if you spend more money to acquire the customer than the revenue it brings, the product is unprofitable. This metric is also crucial to measure your marketing efficiency and reveal idle costs. This acronym denotes an average revenue per user. It is a metric mostly used to track a company’s growth progress. In terms of the MVP, ARPU can show how much you can expect to generate from each user and make relevant tweaks if necessary. As a rule, you need to divide the total revenue by the total number of users to calculate the metric. If you’re selling products not services, the formula is mainly the same, but instead of users, you need to take customers or buyers of your MVP. MVP is successful. It means that the metrics you measure show the good performance of your product. In this case, you should expect a gradual growth of your customer base, relevant feedback on how to improve the user experience, and other signs of raised user engagement. The next steps the product manager can take are getting to the development (for no-product MVPs) or production (for mockups and single-feature MVPs) and promote the product in the market. MVP is not successful. Most startup founders want to build MVP app that wins out, but few of them manage to do this. If you have downbeat metrics, it does not always mean that you’ve lost. Sometimes, you need to pivot and change the course of your idea or business model. And this is possible if you use the minimum viable product at the outset of your project.